Does the title look familiar? Yes, we have borrowed it from the Scottish Waste Awareness Group (SWAG for short) and when they see what it is for I am sure they will not object. NEMT is doing our bit towards the nation-wide drive to minimise our waste and these labels allow you to re-use your jiffy bags and envelopes and address your parcels. 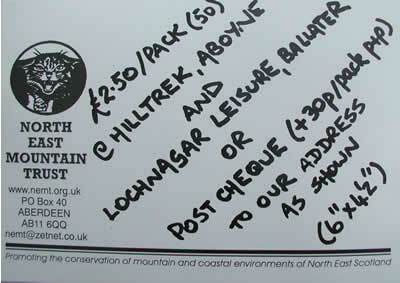 Packs of 50 good quality 6" x 4.5" re-use NEMT labels are now available either from Hilltrek in Aboyne or Lochnagar Leisure in Ballater and at any of our events. Alternatively post your remittance to NEMT's postal address, ie NEMT, PO Box 40, Aberdeen AB11 6QQ. Each pack costs £ 2.50 plus an additional 30p/per pack postage and package. One quick tip however – when you want to take the backing paper off (yes, no licking!) fold them gently to open a flap at the back to allow easy separation. Really, you need never buy another envelope! !